I'm currently sitting in the San Francisco airport, iced coffee in hand, fresh out of a week-long NYC dream. I spent my spring break exploring (almost) every corner of the magical city for my very first time, and falling head over Air Force 1's in love with it. 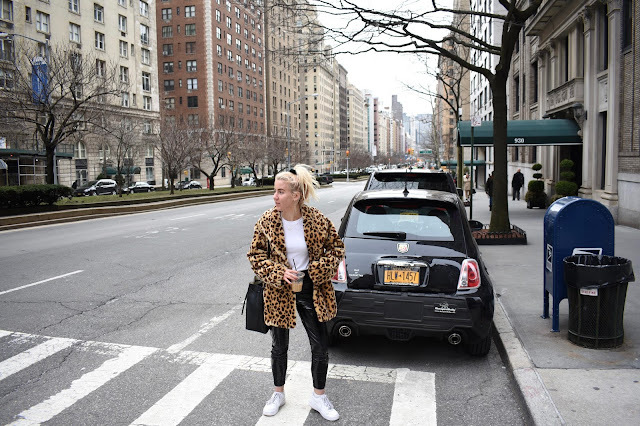 My travel formula typically includes the pieces that I've had on repeat lately: band tees, white sneakers, black denim, and (duh) the leopard coat. Staying within one color palate and vibe allows for some heavy mixing and matching, freeing plenty of headspace to scout brunch spots and decode subway maps. I narrowly escaped a snowstorm and was greeted by gloomy grey skies with temperatures in the 40's (still freezing to my LA genes), giving me the chance to break out my favorite jackets and still play around with not-exactly-practical pieces. This basic but not really look is the first of four NYC shoots I have lined up, so buckle up and prepare to see this jacket at least one more time over the next week. Here's me fresh off of a red-eye flight, eye bags and excitement in abundance as I pose on the Met steps like a complete tourist.